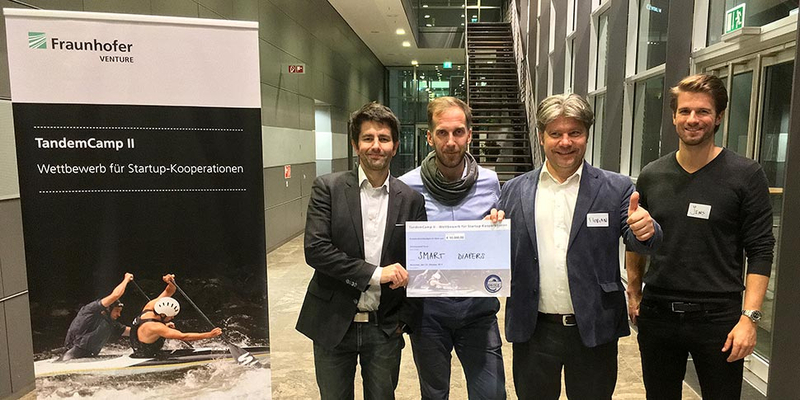 The research group "Internet of Things" from Fraunhofer FOKUS, managed by Dr. Florian Schreiner and Dr. Alexander Willner, together with the start-up company Assistr was awarded with a cooperation budget of 10,000 € as one of five winning teams of the TandemCamp II. TandemCamp is a format of the Federal Ministries of Education and Research funding programme TechBridge, which was developed especially for Fraunhofer start-up cooperations. Tandems made up of Fraunhofer employees and external founders receive both technical and financial support for the first steps of their cooperation. The scope of the funding includes an individual tandem coaching, a planning workshop to improve the organisation of the cooperation, a pitch training for the targeted application for cooperation and the search for financing, a project budget for the first steps of the cooperation and a prominent marketing within the overall organisation. The aim of the cooperation between Fraunhofer and the NBT-Startup Assistr is to enable people in need of care to lead a better life through smart diapers and furthering the digitization of the health care system. At the "Startups@Digital Networking by Fraunhofer" event on November 30, 2017 at the Einstein Center Digital Future, Fraunhofer researchers will be presenting their solutions and technologies in the field of digital networking specifically for young companies. Interested Tech-Startups are invited to register for the event free of charge.